Blue cheese is ripened from the inside out, usually pierced with stainless steel needles to allow air into the cheese. Three different rind types are used when making blue- Natural rind, Rindless and White rind/ Blue Mould. Natural rinded blues are usually rich and condensed on the inside as the natural rind allows moisture to evaporate. They can be identified by their natural crusty rind which is usually grey in colour with occasional orange yeast blotches. Rindless blues are made by frequently scraping off any external moulds or unwanted bacteria that form during maturation, this gives the cheese maker more control over the shelf life of the cheese. White mould/ Blue mould blues are the mildest of the three; the inner blue mould is encouraged to grown quickly before the white mould grows to cover the holes. 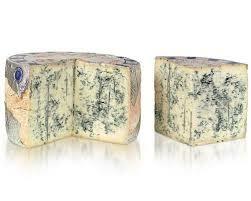 Once covered in the external mould no oxygen can reach inside the cheese putting a stop to the growth of blue moulds.